Watch the full video on our youtube channel. and incorporated solutions in our design. Here is why the ELENOS supply is superior to other designs. as perhaps the most important part of ELENOS transmitters. – even among industrial supplies – ELENOS embarked on a project to design our own supply, manufactured by ELENOS. The DC output voltage is generally fixed, and not remotely adjustable. If adjustments can be made, it’s through a trimmer within 45-52 VDC. 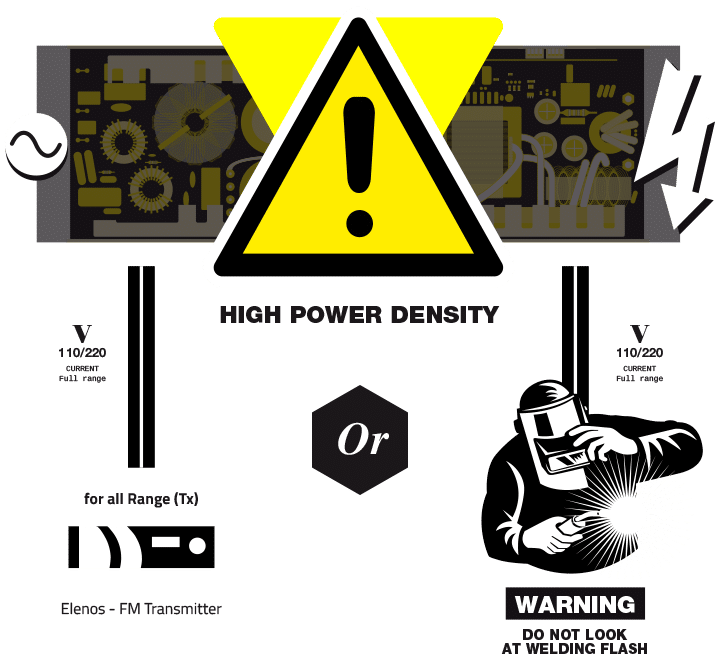 The power supply designed by ELENOS can adjust the output voltage from typically 25 VDC (this value can vary with the model of transmitter from 16 to 28 VDC) up to 50 VDC in order to obtain the maximum efficiency at any RF power level. With a fixed voltage, the maximum efficiency will be obtained only at one well defined output RF power (normally at the maximum power). With the variable supply that ELENOS designed, a wider range of maximum efficiency is realized. Common supplies may not have a communications capacity, only signaling status by high or low levels on certain pins. In the ELENOS, the supply actually communicates all of the important parameters, such as output current, output voltage, temperature, under-voltage, and supply failure through an RS485 bus to the controller. This permits the supply voltage to be continuously regulated according to the actual situation. For example, in case of excess of temperature in the RF PA, the voltage can be reduced in order to reduce the RF power (and the temperature) without loss of efficiency. A suitable algorithm allows the transmitter to obtain the maximum “safe” output RF power. Similar management is made in relation to all the temperatures inside the transmitter, as well as the VSWR. 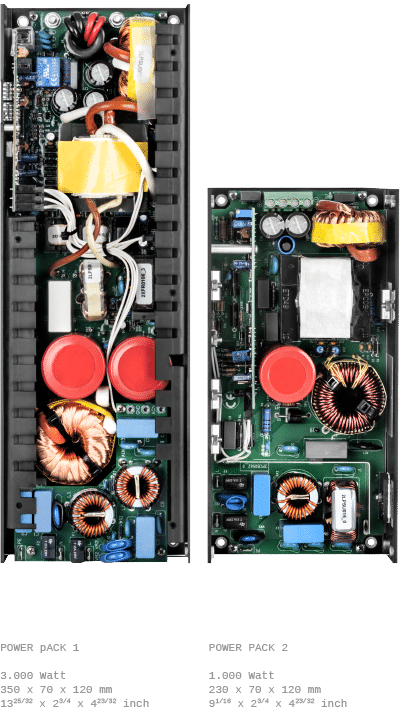 Not one of these features can be performed without a remotely wide-range regulated power supply, such as we use in the ELENOS products. In typical switching supplies, the ”share” of the power is made in analogical mode, usually with a 10% error in output currents. This means that 10% (more or less) of available power in a shared system is loss. In the ELENOS supply, the currents are shared, thanks to that powerful RS485 communication bus that is capable of obtaining a typical accuracy of 2-3% over the whole voltage range. It’s this accuracy that also provides premium performance during voltage brownouts. Speaking of under-voltage, such as during brownouts, the common switching supply offers no protection against an under-voltage situation. Simply, the output current has to be reduced. In the ELENOS transmitters, this situation is automatically managed, and the maximum output current is reduced without the necessity of manual adjustment of the output power of the transmitter. This means performing to the maximum allowable RF power. In the common switching supply, it is not clear what happens in the case of short line interruptions; in particular, when the short interruptions are very close to one another. This condition puts a huge stress on the inrush current limiter, and can be the cause of failures. The ELENOS supply relies on a powerful algorithm that protects the power supply against any kind of energy burst caused by brief interruptions. Broadcasters can enjoy peace of mind when selecting the ELENOS transmitters. The entire transmitter design was specifically designed for heavy duty broadcast use. Our power supply was designed for harsh environments, handling bad quality power lines, which include fluctuations, interruptions, fast transients and so on. Why choose a transmitter using a “commercial” supply, not designed to handle these rigorous conditions? We are world leader in manufacturing innovative, state-of-the-art FM transmitters. Our transmitters are widely acclaimed for their compact design, low energy consumption, and reliability.